Martin Luther King, Jr. left us a legacy, teaching us as much through what he did as what he said. Maybe more. 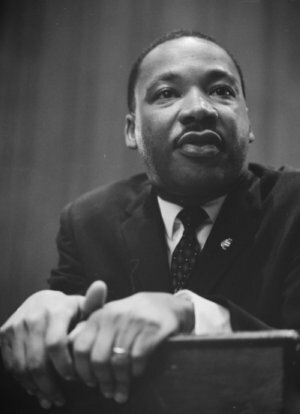 One of the many lessons Dr. King exemplified was the effectiveness of a life lived out loud, one in which a person’s words and dreams are backed by considerable action. He showed us our lives must be lived intentionally and without regret, that words mean something and we must speak up in the face of injustice. He taught us that it is one thing to say you have an idea and quite another to act on it. And the man’s courage still inspires millions of people today. I’m glad Dr. King spoke up and then acted. The world is a better place because of it. Here are five lessons we learn from this pioneer of civil rights (all quotes from Dr. King). Words ring hollow when you declare something with wavering, weak words. When your message lacks conviction, we notice. It would be better for you to say nothing than to mutter a few wimpy phrases followed by parenthetical caveats and exceptions. MLK never spoke like this. He understood that if you are going to change things, you will need to be bold. Your words, as well as your life, will have to reflect this. You may have to say something that is hard. You may be required to challenge the status quo or even hurt someone’s feelings — not intentionally, of course, but because not doing so would be a disservice to the truth. So when that time comes, be absolutely sure of what you say before you say it. And then, say it. With boldness and conviction, as well as sensitivity and grace. But make no mistake: You must speak up. No pussyfooting about it. All I’m saying is simply this, that all life is interrelated, that somehow we’re caught in an inescapable network of mutuality tied in a single garment of destiny. Whatever affects one directly affects all indirectly. We cannot attempt to live, or tell, a compelling story without being conscious of others. Everything we do is affected by and has an effect on other people. We are in this together. Until we realize this, we are not living to our fullest potential. We are, instead, aimlessly and irresponsibly wandering. Until we start telling stories that unfold symbiotically, we are not telling truth. We are simply reciting fairy tales. We need more honest stories that call us into a deeper reality. This is where we all long to live, isn’t it? It begins with compassion. There is nothing safe about being honest, nothing comfortable about doing the right thing. If anything, when you are committed to saying what needs to be said, it will likely get you into trouble. But the fruit is worth the pain. You’re the one who has to decide this, though. Choose wisely before opening your mouth, and be aware of the consequences. Because as with MLK, this may cost you your life. But of course, if you don’t speak, it could cost you something far greater. It is a dangerous thing to strive for the popular vote. As a leader, you will be asked to compromise all kinds of values to please others. Sometimes, this is good; it teaches you flexibility and humility. But the practice of consensus-building can be very, very bad. Steve Jobs showed us this: People don’t know what they want or need until you show it to them. If you are offering a new paradigm, you cannot assume the masses will know or care what you’re talking about. You have to show your audience the Promised Land before they’ll want to go there themselves. You can use this information to coerce people or help them. It’s up to you. Whatever you do, beware the temptations of flattery. If all you’re doing is following the status quo, you’re not leading. You’re entertaining. MLK often spoke about the importance of believing in yourself before trying to convince others to do so. He knew that if we doubt ourselves, so will others. He also knew human beings cannot act according to their identity until they believe it about themselves. In the field of creative disciplines, we see this to be especially true. “A writer is a writer when he says he is,” says Steven Pressfield. There’s something about the power of declaration via our voices that forces our hands to act. This may be the most important lesson Dr. King taught us: we are what we are when we decide to be it. May we honor MLK’s memory by boldly being and believing who we are, then acting on it. What lessons have you learned from the life and legacy of MLK? Share in the comments. Here’s to believing more fully that I’m a writer this week. Thanks for these words! Beautiful post, Jeff. Thanks for reminding us not only about the things repeated every year on this day, but of the truths he shared that are not as often repeated. You’re welcome, Ava. Thanks for reading and sharing. I have often watched his speeches on youtube – his words still inspire, bring hope, and strengthen those weary with burdens of all sorts. Thanks for sharing. agreed, there was something about the way he communicated that was captivating. This is the quote that has always inspired me most. The lesson is clear of course and a good reminder for my ego driven quests to please others and garner praise. I love that quote too. Thanks for reminding me on this special day. Go. Do. Be. No Fear. Awesome. Here’s a couple more thoughts from MLK that inspired me today. Not sure how valuable a lesson this is, but the life of Dr King certainly taught me to avoid balconies. Loved this Jeff. Thank you. It’s interesting also when we see this in context. Dr. King was telling people to believe in themselves because they had systems built up around them telling them that they were second-class. And I think about what systems are built up around me – whether it’s requirements for fancy degrees or making a certain amount of income. Or being popular. Or being attractive. And how many systems I’ve built up around myself with my own hands. Like what I have to do to be worthwhile. Like what I have to tackle to mean something in this world. From him I’ve learned not to settle, especially for what society thinks things should be like. in terms of writing, people don’t think that you’re an author unless you get published traditionally, I tell that the money is the same. It’s also nice to be able to build your own platform and help people! Great thoughts, Jeff. Love this! Listened to a sermon yesterday that taught the importance of speaking boldly. Thanks for the confirmation. Loved this post and the video! Thanks for posting! Keep up the great work! Being a Canadian living in Australia, I can’t say I know a lot about Martin Luther King. But, this statement hit home for me: “There is nothing safe about being honest, nothing comfortable about doing the right thing.” Very true, and very thought-provoking. Inspiring words. I particularly liked what you said about ‘the goals.’ It is important to steer clear from goals of being famous. Being popular is not wrong however, making it as you main goal in implementing something makes everything faulty. Thanks for sharing the video and incorporating the word “pussyfooting” into the article. You should be proud of both. Yesterday a grandpa with inoperable cancer told me to, “Live every day as if you are on holidays “. Why do we wait for a cataclysmic event to recognise that every day can bring delight? Would MLK have been as inspiring if he had not been born into a minority group? Would he have been more insightful or more powerful? Would I be a better poster if the keys on my iPhone were bigger? Definitely easier to write on a bigger screen. My fingers will never get smaller however much I diet!!!! MLK’s legacy taught me the difference between goals and dreams. Dreams are things we want to happen, the thoughts that run through our mind as to how life would be if we completed some task. Goals are results of actions we take to make our dreams come true. I can’t say I’ve learned this thing I will share, but I certainly admire and respect it. Dr. King was bold in his declaration of Christ and pointed to the bible in his most powerful speeches. While I can not say for sure, I expect that he not only understood the concept and reality of spiritual warfare, but I believe that it was because he understood it that his earthly presence reflected the love of God for His people in such a powerful and meaningful way. I speak not only of black people, but he championed for all those who were heavy laden, whether they accepted him or not. There was once controversy about his private life and people tried to discredit his message, but what those folks didn’t know, and sadly some today don’t know, is that God can use and will use anyone willing to boldly declare Christ to the world. However long, however short. What a beautiful man he was. I often wonder what the world would be like today had he lived longer. Living through the last election, barely able to credit the in your face, I don’t care about anyone but me attitudes – – the true “entitlement” gang, and then the relief of the reelection, I am reminded of K . D Lang’s comment during a concert the day after Obama was elected the first time: How did it feel to wake up in America again? And she was born in Canada, where I was considering moving if the Goose Steppers had taken over the White House. After reading Jeff’s post this AM, I was moved to comment, while amidst my friends and those I work with, this would have come close to getting myself stoned in the ancient sense. All of them screaming bloody murder about their money and their “rights” rather than righting any wrongs. I don’t know whether there was any truth to the smear attempts on MKL, but it really doesn’t matter as he eclipsed the darkness with his actions. That he was eloquent as well gave him the power to reach us today. I always found common ground with Dr. King in his objective — a colorblind world. I was seriously at odds with some of his methods. I was most completely at odds with people he allowed to influence him in his later years to pull away from his Christlike beginnings. However, every hero is still a human being. Despite his disappointing mistakes, many of his accomplishments deserve our praise and admiration. You have pointed out five traits that made him strong, five traits worth emulating. His willingness to do the unpopular thing precisely because the truth demanded it is one of his most admirable qualities. I know that seeking, speaking and trying always to act on the truth are things that put me at odds with a lot of people. I admire people who speak the truth, and I try to remember that they, like me, will have their days when the truth is not in them. I try very hard to stand strong through my own dark days, and I pray that when I have failed my readers, they will forgive me and give me another chance to serve them. Words can wound and they can heal. They can inspire to greatness or plunge into despair. and others changed our world with their words. if we all weighed our words on heaven’s scales. Jeff, this post was amazing for me to read. It moved me- your words moved me and so did those of MLK. In 5th grade I memorized his “I Have a Dream” speech and won an award for it. Have never seen the one on the video- WOW! Dr. MLK’s words were so powerful and moving because he didn’t just speak them – he believed them and he acted on them. He showed the world how to be better, he didn’t just tell the world how to change. He was a true hero! Thank you for this post! Thanks so much for this article, Jeff. I will share it with my high school fiction writing classes. Ha, the advanced class is all guys, isn’t that something? We have way too much fun in there. Jeff, how do we fight the popularity factor? I agree with what you said. But It is hard to find the balance when popularity is tied to things like readers on a blog, influence, money, etc. how do you find the balance? By realizing that no amount will satisfy. goodbye to my first Hospice patient. She would have been 100 in December. I read the https://goinswriter.com/mlk-success/ first, which made this blog better for me to read. Good article. I love Martin Luther King.